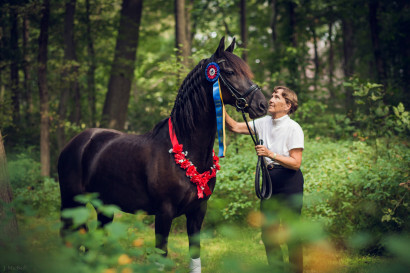 Schengrund Stables would like to congratulate one of our homebred horses, SSLLC Collective Soul (Tug Hill Whamunition x Brio Bell Martell) on earning top honors for the second year in a row in the Adequan/USDF All-Breed Awards. “Alex” won first place in the First Level Open Division with an average score of 67.411% under the direction of Pamela Thomson for owner Cara-Lynne Schengrund of Hummelstown, PA. The team, along with other winners, was honored at the Adequan/USDF Annual Convention in December. To learn more about this program visit www.usdf.org/awards/all-breeds/all-breeds.asp.